Earlier today we released the 4th part of our new football season guide in the form of our much anticipated ‘Combo Tipster Report’. It is essential reading for anyone who follows football tipsters (or just tipsters in general) as it showcases just how you can improve your betting profits by using just one simple strategy. So if you are keen to find out how the Combo Tipster Report can help you, read on for more details! What is the Combo Tipster Report all about? What happens when more than 1 tipster puts up the same team as a bet? We have all heard of the phrase “2 heads are better than 1” and we wanted to put this to the test by analysing 4 top tipsters across all 4 top English leagues to see what happened when they put up the same tip. We spent hours plugging the data in and researching this question, yet it was well worth the effort as the findings were impressive to say the least! Tell me about what you uncovered? We found that there was a clear pattern of boosted performance, especially when 3 of the 4 tipsters put up the same team as a bet. All told, by following this Combo Method, you would have made an extra 14 pts profit from 1402 fewer bets. Critically this boosted your ROI by 9.5% as well. …And so on the back of this knowledge, we have put together 6 recommended ‘Combo Tipster’ Systems for the new season, which are also listed in the report. What are these Combo Tipster Systems and how can they help? The basic theory here is that by either focusing in on these ‘Combo Tipster’ selections alone or by staking more on them we can massively improve our betting. Each of the 6 Combo Systems therefore take a different approach when it comes to staking. For example Combo System E (which is my favourite) suggests staking 1 point on any tips highlighted by 1 to 2 tipsters, and staking 2 points on any tips highlighted by 3 to 4 tipsters. Had you done this over the past 4 seasons, you would have placed 4998 bets with a profit of 378 points and ROI of 6.4%. Best of all though is the Betting Bank Growth (or ROC as we often term it) which stands at 378% over the past 4 seasons. Averaging 94.5% per season. Exactly how can punters put these findings into practice? It can help you in 2 different ways. Second of all, punters can benefit by applying this Combo Tipster theory to their own betting. Do you follow more than 1 tipster and wonder what to do when they back the same horse or team? Well our research shows that if they are genuinely good individually, together they will perform even better. What else is in the Combo Tipster Report? How the odds compare if taking an early price on a football bet, set against the odds at kick-off. Is it better to bet early or late? Our research reveals all. Which method of football betting will make you the most bang for your buck – Asian Handicap or Win only? We have another article devoted to this topic. How the top tipsters perform by league – find out where they make money and where they struggle! Which bets you should cut out from your football betting and why – our odds analysis reveals the least profitable bets you can do without. You can grab your copy of the Combo Tipster Report PLUS our full 5 part new football season guide with a Smart Betting Club membership. On Monday, the BBC screened the first episode of their new ‘Britain At The Bookies‘ series – designed to explore the winners and losers of the UK betting industry. As part of the series, bookmakers Coral invited the BBC cameras into one of their best performing stores in Huddersfield as well as the Coral head office, no doubt keen to showcase the more ‘human’ side of their operation. It’s a reasonable enough 60 minutes watch, even if just to witness how different punters suffer at the bookies hands – from the poor guy spending all his benefit money on FOBT machines, though to the educated punter struggling to get his bet matched as he is a serial winner. And if you too are a successful punter (or have aspirations to be one) then this show is a good reminder of the fact betting is a winner-takes-all battle between punter and bookmaker. One wins, one loses and there is very little in-between – despite the bookies ‘chummy’ attempts to woo us with free bets and cups of tea or the facade that bookie shops are ‘part of the community’. Shops exist these days primarily as they can hold 4 FOBT machines in each one. And in today’s unfair betting climate, to be a continuous winner over the bookies you have to be shrewd, adopt the right tactics and bet on the right sports in the right way. In Episode 1, a trader from Coral openly admits that they they track IP addresses when it comes to identifying winning gamblers – so covering these tracks is a must first off. The solution therefore is to use one of the many VPN (Virtual Private Network) solutions available which help mask your IP address location. One very easy to use VPN is Zenmate – A free add on to your internet browser, which you can turn on and off in an instant. When switched on, it fools the bookmaker as to your location and IP address, so they can’t easily link you to past successful bets or accounts you may have held with them. It’s ideal for those of you who find yourself unfairly restricted or closed down for winning money in one account and are keen to open up a second. Prevention is always better than cure and often the best way to avoid restrictions is to pretend to be a mug punter in the first place. Bookmakers like Coral really only want mug losing punters and anything you can do to convince them you fall into that category is a must. For example, I understand that Bet Victor like to see their customers play in the online casino for the simple reason that the vast, vast majority of people who do, lose money and help swell their shareholders coffers. Therefore the simple act of spinning £10 or £20 on the roulette or blackjack table every couple of weeks can help keep up the charade that you might not actually know what you are doing. Even if you actually do. Most of the difficulties punters face getting on these days revolves around horse racing, where bookies are very wary of taking bets on the sport. This has also lead to many punters frustrated by horse racing to turn to football, where it is a heck of lot easier to get on and make money betting. In fact, football is awash with bookies and exchanges willing to take your bets on the sport (such as Matchbook & Smarkets) with many of them offering competitive odds, high stakes and who actively welcome winners. It is one reason why many SBC members after maximising all they can via horse racing, look to football to expand their profits. At the very least, it is wise to mix up your betting beyond just horse racing for this reason. Adding in as much football betting as possible can often help extend the lifespan of many a betting account. It’s not just football capturing punters imagination these days but US Sports such as NBA, NFL & NHL which offer some fantastic opportunities for shrewd punters to win money without restriction. If you have never bet on some of these sports or have no idea how they work, then rest assured they are actually very easy to follow indeed. The markets again offer great liquidity, competitive odds and make the horse racing betting market look prehistoric. You are also not limited to the usual bookmaker suspects with exchanges like the aforementioned Matchbook & Smarkets alongside others such as 5 Dimes and Pinnacle Sports offering huge margins and welcoming winners. The 4 bits of advice above are just the tip of the iceberg for what you need to know as a serious punter and if you are keen to find out more about beating the bookmaker then you might like to consider a Smart Betting Club membership. As well as regular reviews on all of the best UK and USA sport tipsters, we also regularly publish expert reports such as our VPN Special & Bookmaker Special guides from 2014. The information found in both of these reports is very much still relevant and can help you keep one step ahead of the bookmaker. All of which is instantly accessible with a Smart Betting Club subscription – available now with a full money back guarantee if in anyway not satisfied by our service. The Smart Betting Club’s new Fink Tank Football Service is now open and available to new members for the forthcoming 2015/16 season. This service will be the ONLY place where you can access the Fink Tank Value Bets this season for all 4 English Leagues. Once again we will be providing the bets across the 4 base systems that proved so successful last season when we placed all of the qualifying bets up on the SBC Forum. All 4 recommended base systems made a strong profit, ROI or ROC as in the table below. Translating this performance into both a £2000 or £5000 betting bank also helps to reveal how profitable each of the 4 base systems were during the 2014/15 season. Access to the Fink Tank Football Service is available via subscription with a £10 earlybird discount on offer to those of you subscribing before the end of the month. There is a further discount available for those of you with either a Gold or Platinum SBC subscription. Full details are now available via the Fink Tank Football Service page. An exclusive package featuring everything you need to know about the best tipsters, systems, strategies and brokers to maximise your football betting this season. Sign-up here to gain instant access to your copy now. 1. Our review of the niche-market football tipster with 112% Betting Bank Growth from their first 2 seasons tipping. 3. Our exclusive review of the UK licensed bet broker offering UK punters access to very competitive football odds. 4. A major update on our fantastic ‘Combo Tipster Report’ on how you can improve and streamline your football betting returns by pooling advice from many popular tipsters. 5. A special ‘Football Tipster Profit Report‘, featuring updated tipster tables, ratings and interviews with all of the best football experts. 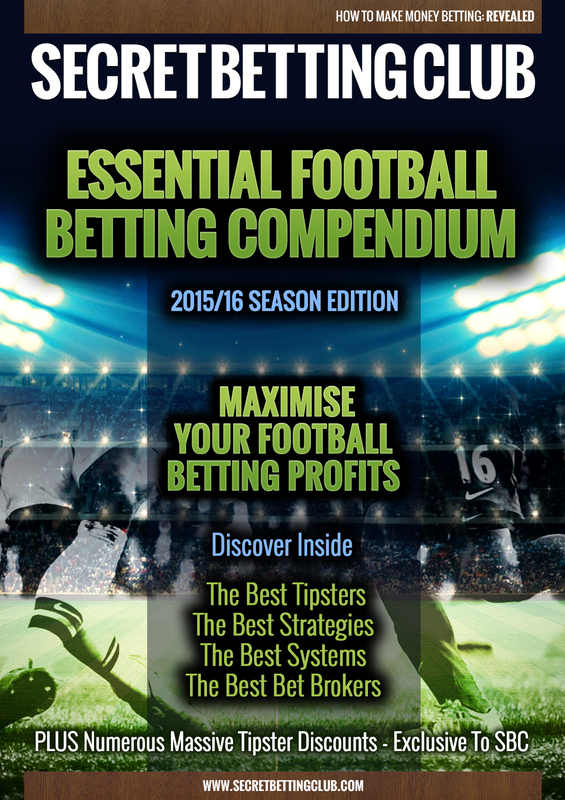 Subscribe Now and gain instant access to all parts of the Essential Football Betting Compendium and maximise your betting this 2015/16 season! The Smart Betting Club are pleased to announce that we have secured the exclusive rights to distribute betting tips as generated by the long-running ‘Fink Tank’ Football System for the 2015/16 season. These tips are based on the football ratings built by Decision Technology (Dectech), who after several seasons of providing ratings for free online, recently announced their decision to withdraw their free publication from July 2015 onwards. Mindful of the interest in this system from many punters, least of all SBC members to whom we provided all the profitable Fink Tank value bets for free last season, we have agreed a deal with Dectech, which will enable us to supply these value bets throughout the 2015/16 football season. Thus, a new SBC Football Service will be launched prior to the start of the 2015/16 season, which will provide all ‘Fink Tank’ value bets for every single game across all 4 English Leagues (Premier League, Championship, League 1 & 2). Full details on this service will appear on the SBC website very soon. In the interim, if you would like to register your interest in this service, please do add your details to our special mailing list below. By doing so, we will notify you as and when this service launches. Last Friday saw the release of the 3rd and latest US Sports Tipster Report, featuring a plethora of tipster reviews and expert guidance for those keen to bet on the likes of Baseball, Basketball, American Football & Ice Hockey. The US betting market is proving to be very popular with many SBC members at the moment, simply due to the great money-making opportunities on offer with the right tipsters and generally speaking, some very punter-friendly bookmakers. To help explain more about these US Reports, we recently Sat down with US Sports Editor, Rowan Day to find out exactly how they can help you make money betting. First of all, can you explain what it is the US Sports Tipster Reports provide? Rowan, US Editor: Sure. The US Reports are based on the format SBC members are familiar with for the Betting Magazine reports we produce for UK and European based tipping services. They contain the same in-depth tipster reviews that SBC is famous for, except this time the focus is on US Sports & betting markets. Our aim is to provide members with the insight needed to enable them to choose who they follow from the most successful US Sports tipsters, safe in the knowledge that the SBC have done their usual, thorough, due diligence. We set out to both inform and educate members who may not be too familiar with the US Sports arena, the betting markets, or the jargon used, but for whatever reason would like to diversify their betting. And of course, as always with the SBC, we want to make sure people are aware of the traps and pitfalls that come with exploring new markets, and believe me, our initial impressions were that there are more sharks and conmen operating in the US tipping industry than there are in the UK and Europe! What was it that made you decide to tackle the US Sports market in the first place? Rowan: It was becoming increasingly clear from feedback we were getting from our members that there is a strong and growing interest in betting on US Sports. Some of the more experienced bettors, who need to be able to get fairly large stakes into markets that could absorb them having had their UK-based ‘High Street’ bookmaker accounts limited, realised that sports like the NFL carry huge markets through every week of the season. Then there were those with less betting experience but who were interested in American sports, perhaps gained from watching the increasing European television coverage of NFL, NBA and MLB, and who wanted to know if there were any good tipsters out there that would add to their enjoyment. What is the appeal of betting on US sports? Rowan: Well, I’ve mentioned the huge markets that carry massive liquidity, and to serious bettors that is a real boon. With the odd exception, we tend to find that good US tipsters don’t cause prices to crash, and generally speaking, if there is an initial drop in the odds offered on a pick, they frequently rebound. There’s also the fact that there are serious US-based bookmakers like 5Dimes who stand a bet to larger stakes and don’t close accounts in the same way as so many of their European counterparts do. OK, so moving onto the US Tipster Reports themsleves, what can you find in each report and what sports are covered? Rowan: The main sports we cover are American Football (NFL), Baseball (MLB), Basketball (NBA), and Ice Hockey (NHL). Across the three US Reports issued to date, we’ve reviewed services that between them have covered all of these sports. Each review really drills down into a service and analyses the results achieved in such a way that bettors can easily see where a tipsters strengths lie, and which can then be exploited to add profit. In addition to the tipster reviews, each US Report contains a ‘how-to-bet-on’ guide on a different US sport so as to help explain them for those unfamiliar. For example, in Issue 3, we feature a guide to betting on Baseball – ideal for anyone totally new to the sport to get to grips with it. Each article breaks down the rules of each of the main sports covered, and allows the reader to start looking for profitable angles for themselves that can be used to make money from betting on US sports. How exactly do you review a tipster? Can you walk me through the process? Rowan: The first thing we do is identify those services that are showing promise and might be of interest to members. We then ask the tipster if we can proof their bets and if so, and once we’ve collated a fair sample of their picks, we let our data analysts loose! They examine every aspect of the tipster’s performance, looking for areas of strength and weakness in addition to the headline ROI and ROC figures. This often kicks up valuable information that can be utilised to increase profits, or at the very least avoid areas where a tipster is perhaps not so strong. For example, we discovered that with one service we reviewed, we could use the data supplied by the tipster in such a way that we could massively increase turnover and ROC in one simple stroke. Information like that is priceless! Anyway, once all the data analysis has been done, it’s sent over to me and I write up the review and present it in a way that is easy to read and follow. You just released Issue 3 of your US Tipster Reports, can you walk me through what is inside? Rowan: We have two full reviews, one of a chap who has done incredibly well tipping in basketball and hasn’t had a losing season since starting his service back in 2007! The other takes a good look at an ice hockey specialist who has achieved an ROC of 360% over just two and a half seasons of betting! As the MLB baseball season is just getting into full swing we also have an article that takes a comprehensive look at the sport, covering the rules of the game, the scoring system, how the league is structured and of course, how to bet on the sport. We follow this up with a first look at what looks to be a baseball tipster with a considerable amount of potential that has come onto our radar. How about Issues 1 and 2 – are they still available and what do they feature? Rowan: First things first, yes, they are still available. Anyone signing up to a Platinum membership will immediately have access to all three US Sports Reports. Issue 1 carried a massively detailed review of a service based out of the States with very reasonable subscription charges and which covers all of the main US sports, plus some others such as college football and basketball amongst others. We broke this down somewhat though, to really get to grips with the baseball bets offered, and then in Issue 2 we did the same with American Football. The findings were extremely interesting to say the least! We also reviewed an NBA tipster in Issue 1, and ran an article taking a look at how to bet on this exciting sport, plus an article outlining the very real traps that exist in US tipping circles and which are very easy for the uninitiated to fall into. For example, whilst we were researching the market, we found that many so called ‘independent’ tipster monitoring sites were anything but! Issue 3 carries three full reviews including two specialising in American Football betting and another NBA tipster, plus another “How To Bet” article, this time on the NHL (ice hockey). Are there any differences between betting on US Sports compared to the likes of Horse Racing and football? Rowan: Fundamentally, no, there are no real differences, really. Some of the jargon associated with US sports betting is different, for example we might place a bet on the ‘Moneyline’ in an NFL match, which simply means we’re backing a team to win. The main differences are not in the betting itself, but the fact that the markets are huge and easy to get a bet into without account restrictions, as previously mentioned. Not something that can be said for anyone who consistently does well betting on the horses! How about US tipsters compared to UK tipsters – what are the differences there? Rowan: One big difference we’ve noticed is that US tipsters seem to have no concept of a completely independent monitoring body. It appears there is no SBC equivalent in the States! Therefore I think to some US-based tipsters, they have a slightly lower expectation of the levels of customer service they feel obliged to provide. Speaking to many people, a lack of communication between tipster and subscriber is commonplace. haven’t ever been proofed anywhere! What bookmakers do you need for US sport betting? Rowan: With the increasing popularity of US sports in the UK and Europe, all the big High Street bookmakers price up US sports markets now. The big Asian books run hugely liquid markets on all US sports, and then there are the American firms like 5Dimes and Bovada that can be used too. It all sounds great, what do you have planned for the future for US Report subscribers? Rowan: We’re constantly scouring the market for more top notch US Sports betting tipping services so that we can break these services down and direct our members towards making strong profits from betting on US sports. We’ve several in the pipeline including a very cheap NFL tipster with a strong track record over the past five seasons, which should come out just in time for the new NFL season in the early autumn. Other than that we’ll be finishing off our ‘How to Bet’ guides with an in depth look at American Football, and we also plan to bring news of tipsters who specialise in areas such as College Football and Basketball which are massive markets in their own right. How can someone find out more on your US service? Rowan: Well they can always contact me directly with any questions they have at rowan@smartbettingclub.com. By following this link too, they can read more about the service and what we have to offer and most importantly, how to join! My thanks go to Rowan for taking the time to answer all of these questions about his US service. You can grab all the US Sports Tipster Reports with a Platinum SBC membership with instant access as soon as you subscribe. 2015 has so far been a fantastic year for many of the top racing tipsters we track and review at the Smart Betting Club – so much so that we have termed it the ‘Bookie Apocalypse’. And if you fancy being a part of the apocalypse (and causing nightmares for racing bookmakers everywhere), we are offering you the chance to enjoy 2 free trials with 2 top racing tipsters if joining the Smart Betting Club before Midnight this Sunday. Both of these tipsters have been racking up the profits lately with the first – James Boyle Racing (who is offering a free 1 month trial) making a 49 pt profit and 106% ROI in June alone! The second tipster – Northern Monkey Punter (who is offering an anytime 2 week free trial) also fared well in June with 10.15 pts profit from 116 bets at a ROI of 9.6%. It’s not a deal to miss out on…here are the details! 1. A free 1 month trial to top tipster James Boyle Racing starting Monday 6th July. 2. A free 2 week trial of the Northern Monkey Punter racing tipster (Can be taken at anytime). There are no hidden costs or small-print to worry about – simply sign-up today for your SBC membership (Gold or Platinum) to qualify for your 2 free trials. James comes into his own when betting on the flat and this has never been more the case than in June as he racked up 49 pts profit from just 46 bets. This equated to a ROI of 106% for the month on its own! This is no flash-in-the-pan either, long-term James has a very fine record going back to 2011 as the table reveals below. At just £10 per point, this is £3,633.00 profit to such small stakes. The tipster behind the very popular Northern Monkey service also has a great record over the flat with a profit of 10.15 pts from 116 bets in June alone. This follows on from his also excellent long-term record whereby a £4000 betting bank will have turned into £15,816.50 if betting on all his advice. Plus several bonus fantastic systems & guides to help your betting. Everything we do is geared towards making you as much money betting as possible, so if yet to take the plunge, why not sign-up before Midnight this Sunday the 5th July and see how we can help you.